We all want the best for our cats – and when it comes to nutrition your choices are especially important. Cats thrive on a diet that’s as close as possible to what they would eat in the wild. But as domestic cats living in an increasingly urbanized world, they also need their nutrition to be optimally balanced. Which is why we have put together our best organic cat food review. Bringing your feline on board the organic food trend can have real benefits for their condition, nutrition, health and even happiness. And, as their owner, you can rest easy in the knowledge that you are cutting out any artificial ingredients or chemical nasties from your furry friend’s diet. But getting the right organic cat food can be a little tricky as you need to be sure what you are picking for your pet is the real organic deal. And a little knowledge of organic and natural ingredients can help you make sure the product you are choosing really is the best one for you cat. To help you get the know-how you need to go natural with your cat’s meal-times, check out our round-up of what we think are some of the best organic cat food currently in the pet stores. With top quality organic chicken as its protein ‘king pin’, this natural cat food comes in an easy to eat dry kibble formula that will help to keep your adult cat healthy and satisfied. With added organic grains, vegetables and brown rice there is enough carb balance to keep his energy up while the wheat, corn and artificial additive free mix is gentle on the digestive system. The nutrient balance has also been worked out well, with 32% protein and 16% fat, all fortified with added taurine for muscle health, as well as top quality natural vitamins and minerals. 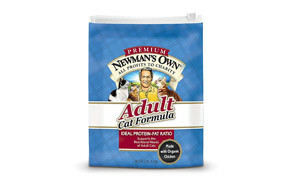 Brought together, this premium cat food from Newman’s Own is a natural and tasty mealtime treat for your feline that won’t irritate his system and can be fed to all adult cats, at any life stage to help them keep healthy, lean and active. Sometimes less is more, and with this natural cat food dry formula from Blue Buffalo, you get a few top-quality ingredients without losing any nutrition or taste. And, as a tempting mealtime treat for a kitty with a sensitive stomach it is an ideal way to keep them nourished. Based around a single animal protein source – white fish – you know exactly what you are putting in their dish. But if simple sound like plain and boring, then you’d be mistaken. Although limited in core ingredients, with this Blue Buffalo Basics cat food, you get the ones your sensitive cat will really enjoy – alongside the fish you get potato and pumpkin as natural sources of fiber while the whole formula is enhanced with omega 3 & 6 fatty acids, vitamins and minerals. And to avoid any irritation, this dry cat food is strictly a poultry, corn, wheat and soy-free zone. And there’s nothing chemical or artificial too. Coming in a large 11-pound bag, you will also get a fair amount of natural meal times for your furry friend. If your cat is more of a water baby when it comes to his food, then check out this canned version of Newman’s Own Premium natural cat food that scooped our Best Choice title. Working to the same organic chicken and brown rice recipe that has proved so popular, the wet recipe is also blended with poultry liver and ocean whitefish to create a lovely moist consistency your cat will love. And it is a good choice for the more sensitive feline too as it has no wheat, corn or artificial flavors, colors or preservatives. The organic wet cat food formula is easy to eat and gentle on the digestive system and, as a little goes a long way, can be used to keep your kit’s appetite satisfied while helping to keep him lean and healthy. And added minerals, vitamins (A, B, E) plus the all-important taurine will keep that spring in his step. 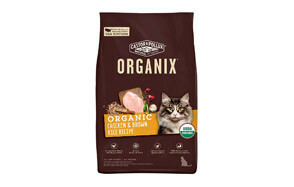 USDA certified, Organix Castor & Pollux Dry Cat Food can rightly claim that its dry cat food recipe is 95% organic and if its cat fans are anything to go by, 100% tasty! With Organix, you can be confident that every ingredient has been organically produced and handled and its production has been done in an organically-certified kitchen facility. This means there are no artificial nasties in this totally natural cat food that could irritate or upset your allergy or digestive-sensitive kit-cat. The main protein source is organic, free-range chicken, boosted by a ‘superfood’ blend of flaxseed, cranberries and coconut oil, then topped off with peas, barley, oatmeal and brown rice. The result is a delicious organic dry cat food kibble that is gentle on your cat’s tum and is fortified with taurine, vitamins and minerals to keep them in tip-top, natural condition. With biscuits small enough for young cats as well as the more senior models, this is a good natural cat food if you need to put your pet on to a more restrictive diet but don’t want to deny them the crunchy kibble taste they love. Using farm-raised chicken as its single protein source, this cat food is poultry by-product and filler-free, so you know exactly the quality you are putting in your pet’s dish. As one of the best natural cat foods on our list, it is also grain and gluten free so ideal for a restricted diet for a more sensitive pet. Add in organic vegetables such as pea, potato and beet pulp, flaxseed and cranberries you have a gentle balance of the natural good stuff to soothe and satisfy. There’s also a comprehensive vitamin supplement as well as added taurine for healthy muscles, bones and immune system. For extra reassurance, Rachael Ray Nutrish handpick and check all their suppliers so you know you are getting premium ingredients and only the very best natural cat food for your pet. Treat your house kit to some delicious and natural whole salmon with this easily digestible wet cat food from Halo. Your cat will love the fish taste and chunky texture of this natural cat food which has only whole not rendered salmon that has been sustainably sourced for a high-quality taste and nutritional value. The natural recipe of this wet cat food is also grain-free and boosted with non-GMO vegetables as well as added cranberry. The whole mix is topped up with added vitamins and essential fatty acids to keep their skin and coat in top condition. With no artificial ingredients or preservatives, the soft, moist texture of Halo Grain Free Natural Wet Cat Food will really appeal to the indoor cat and a little goes a long way. 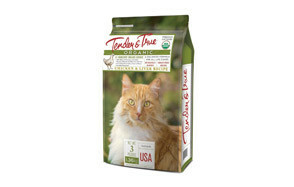 Another of our best organic cat foods, Tender & True has been USDA certified and comes in a delicious organic chicken and liver recipe your cat will find hard to resist. This organic dry cat food looks and smells fresh, straight out of the bag and is a grain, corn and soy-free zone. Artificial nasties are also kicked into touch, with no artificial preservatives, colors or flavors, only bags of the natural and healthy stuff. As well as its organic protein source, the recipe is balanced for optimum nutrition for adult cats and has been enhanced with antioxidants, vitamins and minerals for your pet’s all-round glowing and natural health. This is a sophisticated recipe for your cat, with a deliciously moist pate style organic wet cat food that will keep him coming back for more. Made with free-range chicken and liver, combined with flaxseed, coconut, dried egg and cranberry, this is a powerhouse of an organic cat food that will help to boost and keep your pet in good health. Cooked in an organically certified USDA kitchen you can be assured of its natural quality and it is totally artificial preservatives, chemical pesticide, fertilizer, growth hormones and antibiotics free. For extra conditioning and health support, Organix have also fortified the pate with natural vitamins and minerals, as well as the heart and vision booster, taurine. If you are serious about going organic with your cat and they love their food moist, then this natural wet cat food is more than worth a try. If you cat is cool with grains, then check out this dry cat food from Natural Planet that is packed with good stuff to help him thrive at any age. They certainly haven’t scrimped with the ingredients – with organic chicken packing the protein, the nutrient-rich recipe also includes grains, fruit and vegetables for a nicely balanced organic meal. For extra benefits, you also get added pro and prebiotics, plus the essential vitamins and minerals your cat needs to keep healthy and happy. Plus, there are no fillers or artificial preservatives to irritate your cat’s digestion. All in all, a good all-round natural cat food with some quality organic ingredients and a taste that most cats will love. With 10% protein made up from USDA-certified organic chicken and enhanced with fiber, fats and water, this tinned organic cat food from Natural Planet is a winner for your wet-food loving feline. Suitable for all life-stages and packed with essential nutrients, minerals and vitamins, you can be sure you are feeding your pet a natural and well-balanced meal to meet their daily nutritional needs, without adding any artificial or chemical nasties into the mix. Plus, there is added flaxseed, which provides skin and coat conditioning omega 3 & 6 plus the all-important taurine to keep their heart and eyes healthy. The moisture content is also high, so this is a good meal option if you struggle to get your pet to drink enough water. There can be words on the packaging that indicate the product is organic, but it may not always be the case. ‘Natural’, ‘bio’ and ‘inspired by nature’ all point to a more natural form of cat food but they don’t necessarily mean it is organic. To be organic cat food, all of its ingredients need to be produced in ecologically clean conditions. They also mustn’t contain any chemically produced or artificial additives or preservatives, as well as GMO, hormones, modifiers or other synthetic agents. 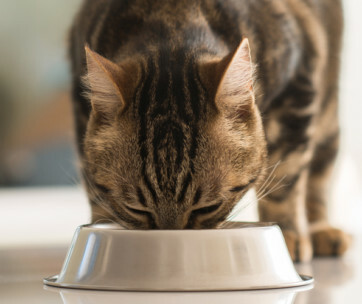 All store-bought cat food will contain some preservatives, so with an organic cat food product, check for natural forms, such as vitamin C or E.
It may have organic credentials, but is the organic natural cat food providing the right balance of proteins, carbs and fats for your cat? The Food and Drug Administration (FDA) requires pet food labels to list the ingredients in quantity order, from most to least, as well as label the percentages of protein, fat, fiber and water. Always read the label to ensure that the organic cat food is not only balanced, any grains are wholegrains and it is free of artificial additives, but it also works with your pet and any health conditions or allergies they may have. 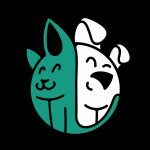 Your cat’s organic meal can also be boosted by a range of natural additives to help their condition, heart, muscles, digestive system and overall health. Added vitamins, minerals and amino acids (such as taurine) as well as probiotics and omega oils are frequently used to fortify cat food so do check the label for their source and to ensure they are appropriate for your particular pet. If your cat has a health condition or a weight issue and you are in any doubt which organic cat food product to choose, do chat to your vet. Not all felines are created equal and so they need to be fed appropriately, even if their meal is organic! With product options for kittens, adult and senior cats as well as larger breeds, outdoor active or homely indoor pets, there is a good range to choose from, so you can get the perfect match. As will all cat food, you need to ensure your kit is getting enough water for their digestion. 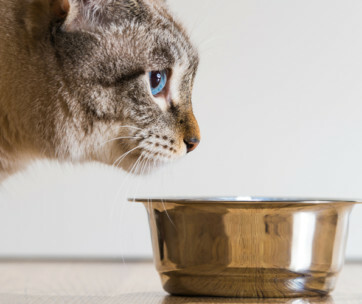 This is particularly important when it comes to organic dry cat food or kibble, so if this is your product choice, make sure your cat also has access to water at mealtimes. As the best organic cat food is not pumped full of artificial preservatives, it won’t necessarily have the longest ‘shelf life’, so if the label shows it has come from overseas, give it a miss. Go local when it comes to the food’s country of origin and you will be getting the best and freshest organic quality for your cared-for cat. Ordinary cat food often contains animal by-products as well as not-always-so-cat friendly gluten as well as fillers to bulk the meal out. And then there’s the artificial preservatives and colors to keep it all looking appetizing for your pet. But while it may look tasty, you can’t always be sure it has the best ingredients or nutrition levels for your furry friend. If your feline suffers from allergies, a switch to organic and more natural cat food could do him the world of good. 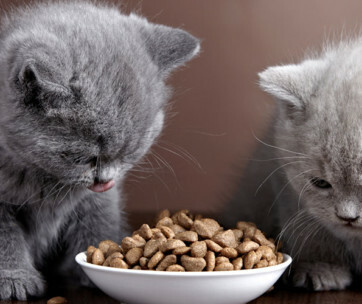 The best organic cat food will typically have fewer ingredients and what it does contain will be of a higher quality. 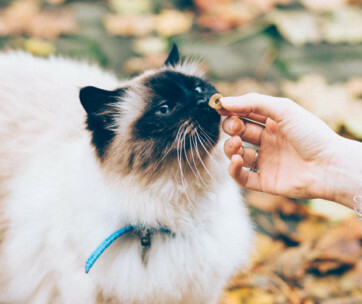 By being free of chemical additives, harmful pesticides and a host of other artificial elements that could be aggravating your pet’s allergy, organic cat food can help to calm and heal his stressed-out system. Natural ingredients and added vitamins and minerals can also help to boost their immunity and overall health. By switching to the organic life, you may also see your cat experience fewer digestive problems as the higher quality grains and proteins make organic cat food easier to eat and digest. And, at the ‘other end’, their poop could also be firmer and less smelly. If weight is an issue for your beloved feline, moving them over to organic cat food brands could make a difference to maintaining a healthy weight. 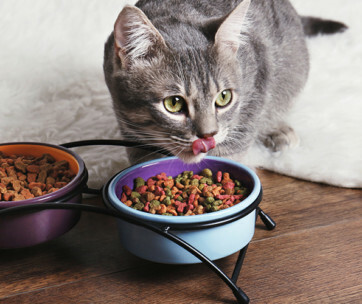 By the high-quality nature of the product, both in content, consistency and taste you should find your cat will need less food at each mealtime, so not only making the organic food go further, but also helping to keep their furry waistline trim. And it doesn’t stop there…with the right level of quality, natural nutrition you should see an increase in their energy levels and an active, happy cat will work of any excess pounds! And last, but not least, a good quality organic cat food will ultimately not only be better for your pet, but by the way it is sourced and produced, it will be better for the environment. Now that’s a ‘win/win’. A:Organic cat food has been made from ‘organic’ ingredients that pass the US Department of Agriculture’s defined terms for the products used. According to the USDA, organic crops must be grown on land that has been free from pesticides for at least three years. And when it comes to the meat used, the livestock must have only been fed on organic feed, has outdoor access and has not been given any antibiotics or growth hormones. For a cat food to be totally made from organic ingredients, the label will read ‘100% organic”. Other distinctions are also accepted with the ‘organic’ label – 95%, 70% and less than 70%. If you are keen to go down the natural route for your cat, always look for the USDA organic seal. A:There’s no denying organic cat food could benefit your feline friend by reducing the number of artificial nasties he eats and upping his daily intake of quality protein, along with essential nutrients to boost his health. As with any food, it will ultimately be your pet who decides because if it doesn’t taste good, he won’t eat it. It is usually as simple as that! For older cats or cats with certain health conditions, organic or natural cat food may not work so well but for most felines, a switch to something more natural and organic protein based will certainly do him no harm. And the investment you make in buying one of the best organic cat food brands could well reap the rewards in a slim, happy, healthy and shiny-coated cat. A:Your cat is a straight up carnivore and would not actually need vegetables or carbs if he was out in the wild. This means that even as a domesticated animal, his digestive system can still only tolerate small amounts of carbohydrates in his meal. A high-protein, high-moisture diet rich in amino acids, fatty acids and other essential vitamins and minerals would be his optimum meal. And in this way, an organic raw diet for your cat could well be an attractive addition to his daily menu. But if you are looking at going raw, you do need to exercise caution. Not least due to safety concerns about the quality of the meat and potential adverse effects on your cat and their stomach as bugs which would be killed through cooking may still be present. 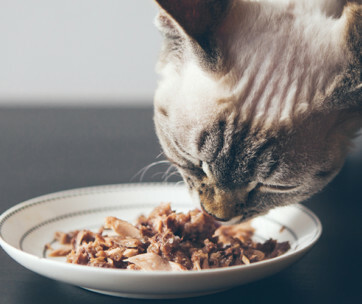 Such a high protein natural diet may also not be for all cats, especially if they have certain health conditions such as kidney problems or they are on the senior cat spectrum. If you would like to consider a raw organic cat food diet for your pet, consult your veterinarian for further advice. With organic chicken as its protein source blended with organic grains, vegetables and tasty brown rice, the delicious recipe behind Newman's Own Premium Adult Cat Dry Formula makes it our review’s top pick. The quality and taste of this natural dry cat food will appeal to even the fussiest of felines and its packed with enough vitamins, minerals and totally good stuff to keep them healthy and happy. This is a versatile and long-lasting bag of dry cat food that will sustain your cat, at all stages of his life.